You have to make these cookies. No iffs, ands or buts about it. These might be my all-time, numero uno favorite cookie. That’s an incredibly serious distinction around these parts. Let me try to explain how much I love these cookies… if you told me that for the rest of my life I could have these cookies, and these cookies only, no other dessert ever again, I would be an incredibly happy woman. There really is nothing more I could ask for in a cookie. They are enormous cookies, first of all. 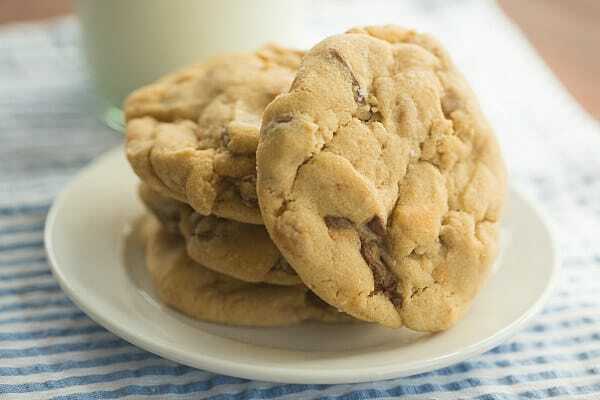 They are also wonderfully thick and chewy, as they are an adaptation of my favorite chocolate chip cookie recipe, The New York Times Chocolate Chip Cookies. 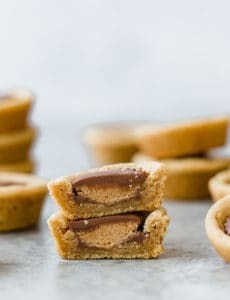 Peanut butter is added to the batter, and a trio of add-ins are included in the batter – peanut butter chips, milk chocolate chips and chopped peanut butter cups. Seriously, I don’t think these could get any better. 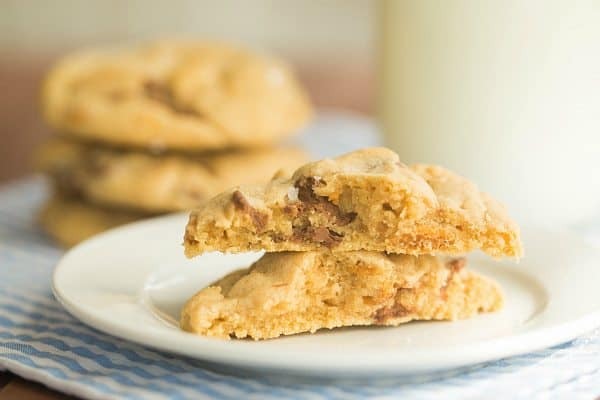 A peanut butter spin on my favorite New York Times chocolate chip cookies. Whisk both flours, the baking powder, salt, and baking soda together in a medium bowl; set aside. In the bowl of a stand mixer fitted with the paddle attachment, beat the butter and peanut butter together on medium speed until light and fluffy, about 2 minutes, stopping to scrape down the sides of the bowl as necessary. Add both sugars and continue beating on medium speed until very light, about 3 to 4 minutes. Mix in the eggs, one at a time, until well combined, then beat in the vanilla. Reduce the mixer speed to low and gradually add the dry ingredients, mixing just until combined. Using a rubber spatula, stir in the chocolate chips, peanut butter chips and peanut butter cups by hand until evenly distributed. 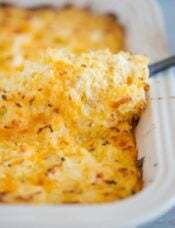 When ready to bake, preheat oven to 350 degrees F. Line baking sheets with parchment paper or a silicon baking mat. Divide the dough into 2½-ounce balls and place on the prepared baking sheet, leaving at least 2 inches of space between the cookies. 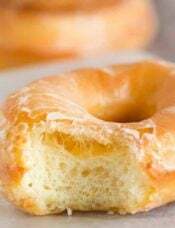 Sprinkle lightly with sea salt then bake for about 15-17 minutes, or until the edges are set and golden brown. 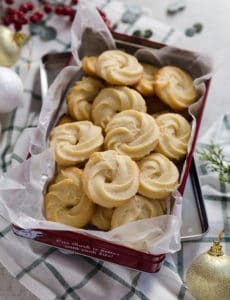 Transfer the baking sheet to a wire rack and allow the cookies to cool for a few minutes before removing the cookies to the rack to cool completely. Repeat with remaining dough (be sure to allow the baking sheet to cool between batches or use additional baking sheets). The cookies can be stored at room temperature in an airtight container for up to 4 days. 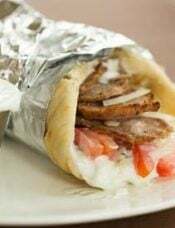 Note: Please note that while I do provide the cup equivalents in the recipe above per reader feedback, I HIGHLY recommend weighing the ingredients for this particular recipe. What’s wrong. 24 hrs, dough so hard can’t get out without chopping with knife. Baked 6, small – maybe supposed to be. Oh, oh! Just ate one still warm. Hmmm, maybe on the right track after all. Will left batter soften and plow on. I produced the six and ate them all. Froze remaining balls. I still think I may have done something wrong. Very thick, taste great but heavy and didn’t spread as wide as expected. I have ingredients for a second batch, less flour, next week. Any suggestions appreciated. 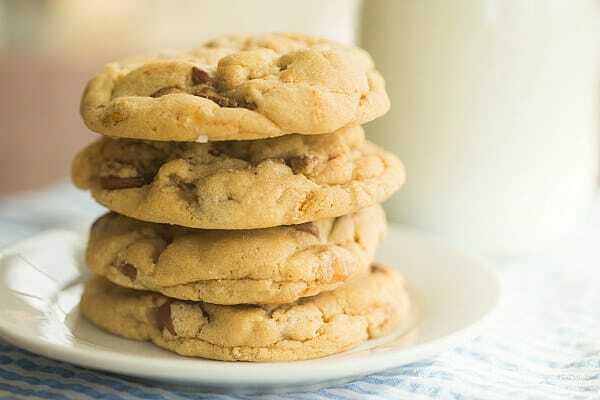 Baking cookies is my hobby which makes my mostly male customers very happy.I must have several hundred cookie recipes in my collection of saved recipes. 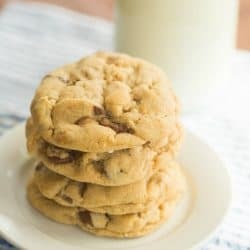 I have to say this is one of the best cookie recipes I have ever made. Even my very “picky” husband loves these cookies. Thank you so much for this recipe , it really is excellent. ps By the way, I am also a huge fan of the New York Times Chocolate Chip Cookie recipe. These are cookie perfection. I can’t wait to make them again now that I know how delicious they are! I took them to a potluck and saw grown-ups slipping these puppies into their pockets on the sly! Must say I was confused with the ingredients. On a measuring cup, 8 oz = 1 cup so I don’t comprehend the 8 1/2 ounces (2 cups) in the recipe. I must be missing something. Will not pay attention to the weight but use the cups required for the flour, sugar. Hoping that will work out! Made these this afternoon. Since I’m a baker and tend to use amateur hockey players as test subjects (getting them to taste and not just inhale was worth the effort), I had everything at hand. Didn’t have the time to refrigerate (next time I’ll allow the time for the flavors to mature), but these were still fabulous cookies. My oven-with-an-attitude took 15-16 mins at a convection setting of 350 degrees. They were FABULOUS!! Matter of fact, they are going to be added to my Farmers Market menu for 9/6 and 9/20 – I was looking for something special and these are it! I finally finally made these. 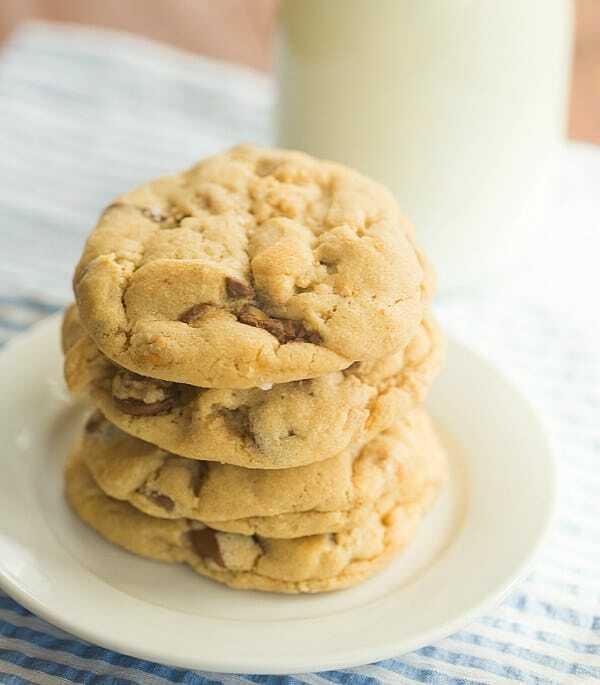 First, I had to buy the right pb cups, then I didn’t have the bread flour, then I realized I need milk chocolate chips not semi-sweet, then when I finally had all the ingredients, I realized I had to allow 24 hours to chill the dough – what a project! Even with all that, when I went to add the cake flour, I realized I only had about 4 oz, so I had to make up the rest with AP flour. Overall, the verdict on these cookies is “meh” – they certainly are tasty, but for price performance, my audience would prefer regular toll house. They are very sweet and rich, and it’s almost like eating a candy bar when you have one, but I want to eat a cookie when I eat a cookie, so there’s that. Maybe our slight disappointment has something to do with the big build up too. Disclaimer – I have never weighed my ingredients before, and this time I did, bringing out my non-digital kitchen scale. As mentioned, I didn’t have the required amount of cake flour, and I also cut 1/4 c of butter out of the recipe thinking that 1 c is more than sufficient especially with the additional PB, and I think I was right. After chilling, I had to use a knife like an ice pick to break up this dough, it was so hard to manipulate. It was either a mass or crumbles – no in between. Also, I made 54 cookies out of the dough – we don’t care for huge cookies, and I wanted to have my son take some on a trip as well as leave some. I didn’t weigh the balls, but they were larger than the balls I make for my sugar cookies. The cookies puffed up more than I expected, so one batch I tried flattening, and that was ok except the dough stuck to the glass or the whole ball crumbled, so I left them balls after that. Bottom line, I’m glad I tried them, but I wouldn’t make them again. I baked these last night (after the dough chilled 3 days) and they turned out fantastic! The balls of dough are huge, but I think that helps keep them from flattening as they cook. I only baked mine 13-14 minutes and took them out when the edges were barely set. After resting about 5 minutes, the inside still seemed under baked and gooey, so I was a little worried I didn’t bake them long enough – but an hour later they had set up quite a bit more, and this morning (for breakfast, obviously) the texture was perfect! Super moist and chewy, just how I like them!! Thanks for the fabulous recipe. These cookies look very tasty. I love the way you combine the salt and peanut butter. Great combo! I made these for our family 4th of July party. Not one cookie left! I will be making these over and over again. Thanks for the recipe. Hi Joanna, You can omit the fleur de sel from the top of the cookie, however the only other flaked salt I would recommend is maldon. As for the bread flour, I do not recommend a substitute, as using a higher protein flour is part of what gives these cookies their texture. I bought the MINI, mini Reese’s cups….the snacking ones that come unwrapped. Was I supposed to get the traditional minis in the gold wrappers? Thanks! Hi Becky, Nope, you bought the right ones! 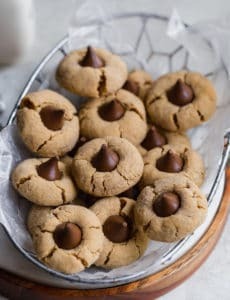 Hi, when baking – do you leave the cookies in balls or flatten them out before adding salt and baking? Thanks. Hi Julie, Leave them in balls. I’ve tried flattening them, but they spread a bit too much for my liking. Just found your site after “Lauren’s Latest” shared your homemade cheez-its recipe on FB (which I’m super excited to try, by the way, because my 3-year-old recently discovered the magical taste of “cheezy crackers” as he calls them. Of course I followed the link to this cookie and I ridiculously excited to try them. I DO own a kitchen scale but I have NEVER used one while baking. Can you explain the importance of doing so? 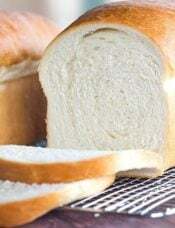 Do you personally prefer baking recipes that are measured by weight? Lastly, how long do you think these keep in the freezer? TIA! The kitchen scale use is purely out of curiosity, not because I doubt the necessity……….just wanted to be clear. Hi Jennifer, Welcome to the site! :) As far as a kitchen scale, I find it to be incredibly more accurate to weigh than to use cups to measure dry ingredients. I would keep them in the freezer for about a month. Enjoy! Must I refrigerate the dough for 24 hours? Can I not just use it right away? Hi Esty, The cookies will definitely taste the best if you refrigerate for 24 hours. I haven’t tried baking them straight away. I baked the cookies straight after preparing the dough- without refrigeration- and they came out delicious! I like to stick them in the microwave for a few seconds before serving them. It’s just like they’re fresh outta the oven! I feel like being in cookie heaven! 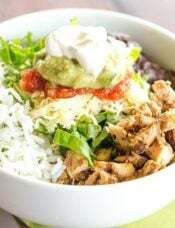 I am going to try the recipe tomorrow. Please cross your fingers that I’ll get all ingredients over here in Germany. 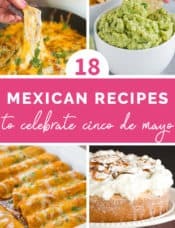 Would you mind if I repost your recipe in German on my blog? I’ll link you if it’s okay for you (I mean my repost).